When you become a new parent, it can be stressful and exhilarating. However, you need to make sure that everything is smooth and comfortable for your newborn. You will not be home all the time and thus, you need a diaper bag for your baby. You might be traveling in your city or out of your city with your newborn. In such cases, a diaper bag will be at your rescue. 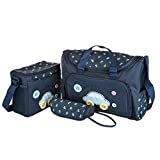 Since it is such an important thing, you need to check all the features of the diaper bag properly and then decide which one to buy. Read on to find out some of best baby diaper bags in india. 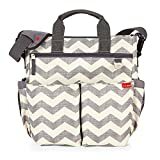 The best feature of this diaper bag is that it comes with a detachable pouch which can be used for short outdoor visits. However, the whole bag can be used for long trips. The bag has two elastic bands for accommodating cups and feeding bottles. In addition, the bag has three pockets inside and two pockets outside. The detachable bag also has enough space to keep all the things. It also has a shoulder belt so that it is easy to carry. It is a multifunctional bag as it can store your baby’s clothes, diapers, towels, water bottle, milk bottle and much more. It is a very spacious bag. The best part is that it has multiple pockets and thus, you can organize all the stuff properly. This bag is also water resistant and has additional shoulder straps which makes it very easy to carry. WEIGHT AND DIMENSION - It weighs 846 grams. Size is 43 cm x 27 cm x 20 cm. ALL THAT IS INCLUDED - 1 diaper bag, 1 insulated milk bottle cover, 1 diaper changing mat, and 1 set of stroller hook. FABRIC AND HARDWARE - The material used is Oxford waterproof fabric, which is easy to wipe and clean. The zippers, rivets, and the buttons used will never rust or give out. OTHER FEATURES - Convenient tissue pocket, key ring hook, D-ring for stroller attachment, back mobile pocket, mesh pocket separation, 2 milk bottle compartments, 2 spoon compartments, 6 internal pockets, and 1 separate zip at the back that leads directly to the interior of the bag that is a special feature for mothers to access the deep interior easily without taking out the top stuffs. 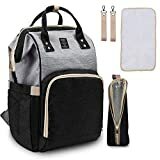 EASILY ACCESSIBLE INTERIOR - There is a zipper towards the bottom at the back of the bag, it is very convenient to put your things into or take your things out. This bag also has a very large capacity. It contains separate pockets for all the supplies of the baby. It is also water resistant which makes it easy to wipe and clean. It also contains shoulder straps which you can widen to reduce stress. You can use this bag as a backpack and as a handbag. A bottle bag, a changing mat and one set of stroller hooks also come with this diaper bag. It comes with both comfort and space. The amazing part of this particular bag pack is that it will comfortably accommodate a 15-inch laptop with all the nursing things. The bag comes with more than 9 pockets with an insulated pocket for bottles. WEIGHT AND DIMENSION - It weighs 740 grams. Size is 42 cm x 26 cm x 14.5 cm and width is 17.5 cm at the middle. 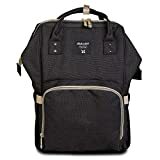 FABRIC AND HARDWARE -This bag specifically features superior quality Oxford waterproof fabric and hardware (zippers, rivets, and the thick gauge buttons) in comparison to the economic version of Motherly diaper bag. LENGTH OF BOTTLE COMPARTMENTS - You can fit in any 2 bottles up to 23 cm in length and 9 cm in width alongwith 2 spoons. 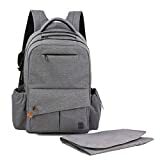 OTHER FEATURES - Convenient tissue pocket at the side, two wide 5-cm shoulder straps, a key ring hook in the interior, 2 D-rings for stroller attachments, 1 back mobile pocket, 1 separate zip at the back that leads directly to the interior of the bag makes this a high utility diaper bag. The bag is lightweight and is made out of an eco-friendly fabric. It is also waterproof. 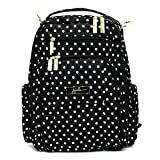 It has a huge capacity as it contains a total of 13 different pockets. 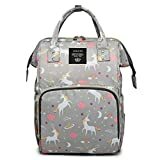 You can also carry your laptop along with your baby’s stuff in this diaper bag. 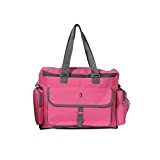 It is a very stylish diaper bag with multiple compartments. This particular bag can be used by mother and father both. The bag comes with an adjustable shoulder strap which lets you make it a backpack or a tote bag. It contains two main compartments with multiple zipped compartments. The bag has a unique feature of wipes dispenser. It is imported from the U.S.
Safety 1st - Our products are EN71 Certified which is most stringent certification defined by European standards for safety of Babies and Toddler. 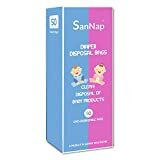 Every minor point is considered to give safest product to your Baby. 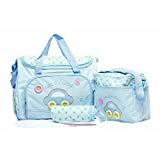 Baybee Kwicky Premium Quality Baby Nappie Diaper Changing Bag Set Feeding Accessories Bag 5 PCs Set- 100% brand new premium quality bags available in the market. Durable and easy to carry everywhere you go. It can hang easily over the buggy, stroller/pram/ push chair. Features multiple compartments and pockets offering enough storage space exclusively for you. Package includes- 1- Large Bag (41 x 18 x 33 approx. ), 1- Parcel Bag (33 x 10 x 27 approx.) , 1- Small Food Bag (13 x 7 x 12 approx. ), 1 Bottle Bag (20 x 8 x 8 approx. ), 1- Diaper Mat (31 x 55 approx.). Comfortable, waterproof, easy clean bags, removable large pouch, wide opening changing bag. Easily carrying in different situations with 2 handles, adjustable shoulder strap available. The best part about this bag is that it is EU Standard certified. It is completely waterproof and very easy to clean. The bag also contains two handles and a shoulder strap which is totally adjustable. This bag comes in a combo offer with three different sized bags, one bottle bag, and one diaper mat. It is a unisex diaper bag with a large capacity. It is the perfect bag to use while traveling. It has one main compartment with three bottle holders and thirteen different pockets. It weighs only 800 grams and offers tissue dispenser. SO IMPRESSIVE IT EVEN "CARRIES" A 100% GUARANTEE! 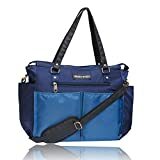 -we are so confident that you will love our diaper bags that we offer a lifetime satisfaction 100% money back guarantee! It has a large capacity and is completely suitable for moms who want to pack things for a full day trip. It is made out of polyester and contains 19 pockets. Only the main compartment has a zipper. It is a bit on the higher side. The bag is well designed and is also budget friendly. It has a large space with eight different pockets to keep all the baby items. The shoulder strap is completely adjustable. It is available in multiple designs and colors. It is a diaper bag which can be carried with the baby while going for grocery shopping as well. It weighs around 408 grams and comes with an adjustable shoulder strap. It has three pockets. It is washable as it is made out of resin fabric. Material: Fabric Large Bag:Approx.38*16.5*28Cm Medium Bag:Approx.25*11*2Cm Diaper Mat:Approx.46*27Cm Milk Bag:Approx.21*7Cm. Package Includes : 1 X Large Bag 1 X Medium Bag 1 X Small Milk Bag 1 X Diaper Mat. The bag is very durable and easy to carry. 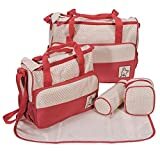 It is a set of four different bags which include one large bag, one medium-sized bag, one diaper mat, and one milk bag. It is imported from Hong Kong. It is very reasonable. Spacious and multifunctional; can store clothes, diapers,feeding accessories, medicines, toys and even lightweight bedding all at once. Multiple pockets on the inside and outside which you can dedicate to individual baby products like pacifier, wipes, diapers etc. Opens widely so that you can see and access the contents inside easily. Insulated bottle holder pocket helps to keep the milk in the bottles warm, Wide shoulder straps provide extra support and make it easy to carry. The bag can be totally used for a short outing or a day trip. It has one main compartment with a zipped pocket in the front. It also has 2 pockets at sides. The diaper bag comes with a bottle warmer and a changing diaper mat. 13 pockets for ultimate organisation. Light grey lining prevents black hole situation. This bag is very stylish and it actually does not even look like a diaper bag. It is made out of water repellent fabric and has a total of 13 different compartments. It is a chic unisex bag which is made without compromising its functionality. This bag is multi-functional as it kicks up as a baby carrier. It is perfect for moms who travel alone. However, it has only 3 different compartments. You can use it to keep the bare essentials. The bag is both stylish and functional. It has a total of 11 different compartments with 4 different elastic pockets. It has an outside tissue pouch. It is very functional as it contains a total of 11 different pockets to keep all the baby stuff. It has two grab handles and a strap. It also has shuttle clips which allow you to hang the bag anywhere. The bag has a place to hold a tablet, phone or a laptop. The bag is made out of Teflon fabric which is non-absorbent. Hence, it keeps the contents inside the bag dry. It has a removable messenger strap with two shoulder straps. It has a total of seven pockets. It is a backpack styled bag with 14 different compartments. It is made out of polyester fabric and is completely water resistant. It ships from the U.S. Durable & Lasting-We Always Use The Premium Leather Zippers For All Of Vismiintrend Baby Backpack Diaper Bag. This Strong Zipper Has Been Tested And The Lifespan For Up To 50,000 Times, Which Means You Will Have A Diaper Backpack That Lasts For Many Years. 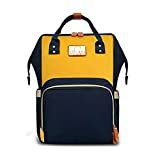 Safety & Eco-Friendly-Made Of The Ultra Premium Waterproof Fabric Passing Sgs Environmental Protection Test, No Toxic Compounds Such As Lead Or Formaldehyde, This Diaper Bag Backpack Would Be Better Protect Your Baby's Safety. And This Fabric Is Very Easy To Clean, So You Don't Need To Afraid Of The Spill Of Milk Or Water. Superlarge Storage Space-This Mommy Bag Have 2 Main Compartment And 15 Spacious Pockets. At Least Can Stored 10-Piece Diapers, 5 Sets Of Baby Clothes, 3 Insulated Milk Bottles, 2 Barrels Of Milk Powder, 2 Pairs Of Shoes, 2 Water Bottles, 2 Children's Toys, 1 Ipad, Mobile Phones, Wallets And Keys, Etc. A Nappy Bag That Dad Like Too-The Diaper Bag Backpacks Are Built For Both Mom And Dad With Its Stylish And Unisex Design, Adjustable Shoulder Straps Make It Fit For All Small, Medium, Plus Sizes, Save Your Budget By Sharing The Nappy Bag With All Caretakers. The bag comes with premium leather zippers and is completely durable and lasting. The bag is made out of eco-friendly waterproof material. The bag is huge as it has 15 spacious pockets. You can hang it on the stroller or use it as a handbag or backpack. 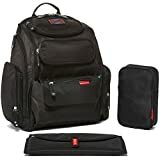 There are a lot of different diaper bags available in the market. Buy one according to your need and usage and as per convenience. Also, check the brand and customer reviews properly before buying. Make sure to buy a unisex one so that the men in the family do not feel awkward while carrying the diaper bag. We hope you liked this extensive list of “Top 20 Best Baby Diaper Bags in India”.